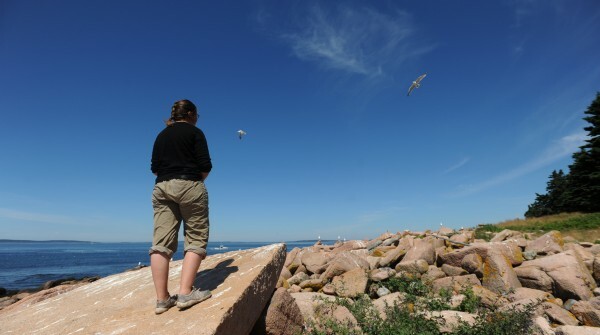 College of the Atlantic student Kate Shleper looks out over one of the gull colonies on the western shore of Great Duck Island on Monday, July 25, 2011. The colony has experinced a high incident rate of eagle attacks on Herring gull chicks. 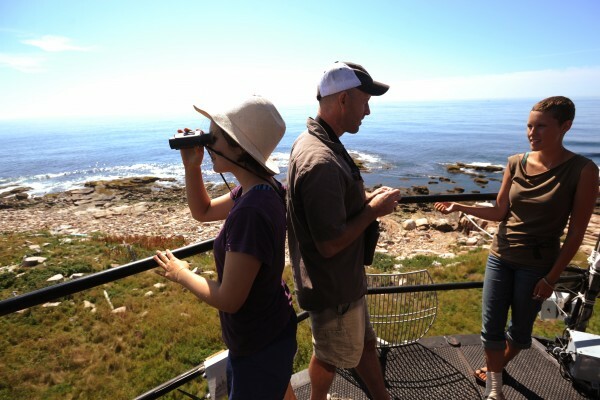 College of the Atlantic student Robin Owings (left) uses binoculars to view the southern shore gull colony on Great Duck Island as COA president Darron Collins (center) talks with student Aly Pierik on the observation deck of the Great Duck Island lighthouse on Monday, July 25, 2011. The colony has experinced a high incident rate of eagle attacks on Herring gull chicks. A Herring Gull chick walks along the rocks on the western shore of Great Duck Island on Monday July 25, 2011. The chicks have come under attack from eagles recently. COA students have observed eagles swooping down and plucking the chicks from the rocks. GREAT DUCK ISLAND, Maine — According to researchers on this uninhabited, remote island, each attack is accompanied by distinctive, high-pitched screams. The cry goes up as the adults realize their young are in danger. They take flight, warning each other and their offspring of the marauding intruder and hoping to drive it away. Their efforts always are in vain. Inevitably, the attacker leaves with a full belly and the colony with fewer residents. Bald eagles are the top airborne predator along the coast of Maine, and instances of them eating smaller birds such as herring gulls that rear their young on Great Duck Island have long been known. But according to ornithologists, the effect of this behavior is becoming more pronounced and noticeable as the number of bald eagles — once only a few dozen in Maine — has now rebounded to close to 2,000. Bald eagles had suffered steep population declines that were brought on by decades of hunting, habitat destruction, and especially the use of the pesticide DDT after World War II, officials have said. They were legally protected under the federal Endangered Species Act from 1973 until 2007. John Anderson, a natural history professor at College of the Atlantic in Bar Harbor, oversees the college’s summer research program on Great Duck Island, where students study the island’s seabird colonies and other natural phenomena. As Maine’s population of bald eagles continues to increase, he said, it could have dire consequences for bird species that flourished when the number of eagles dipped dangerously low. Anderson said last week that some gull populations in Maine have dropped by more than half during the past decade. Part of the decline can be attributed to the closure of dumps and open landfills, which once were the primary food source for the gulls, he said. But he believes the resurgence of eagles and the increasing number of eagle attacks like those he has witnessed on Great Duck Island are major factors in the decline of gulls and other seabirds along the coast. Brad Allen, a seabird biologist with Maine Department of Inland Fisheries and Wildlife, agreed that the decline of the gull population in Maine has been steep in the past 10 to 15 years. He said that between 1996 and 2008, the number of black-backed gulls has declined by 42 percent and the number of herring gulls has declined by 30 percent along the entire Maine coast. In Hancock County, where Great Duck Island is located, the number of black-backed gulls declined by 62 percent while the number of herring gulls declined by 25 percent during the same 12-year period, he added. “Bald eagle predation is probably responsible for a lot of this decline,” Allen said last week. According to Linda Welch, biologist with Maine Coastal Islands National Wildlife Refuge, the 2008 statewide population estimates — the most recent available — range from around 9,600 each for black-backed gulls and cormorants and approximately 25,000 for herring gulls. Welch said Monday that it is part of the mission of the U.S. 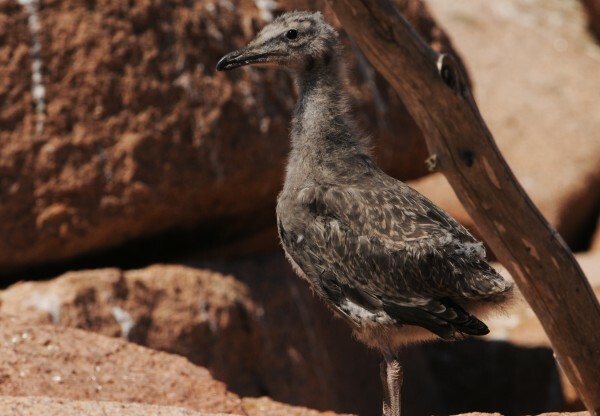 Fish and Wildlife Service to periodically conduct surveys of seabirds, in order to gauge the relative health of their species. Food also has been a problem for gulls and other seabirds, according to scientists. Between 1987 and 2000, 94 percent of all municipal landfills in Maine were closed at the same time that fish stocks were declining in the Gulf of Maine. Allen said terns especially have been having a tough time raising young this year in eastern Maine, where there seem to be fewer herring this summer. Simultaneously, the competition among larger birds for other food sources such as small birds and chicks of other species has gotten more intense with the eagles’ recovery, he said. Welch said cormorants have experienced even steeper declines. Between 1996 and 2008, when the most recent statewide seabird surveys were completed, the number of cormorants in Maine dropped by 45 percent, she said. Washington County is where the large gull populations have declined the most, Welch said, with a 65 percent drop for black-backed gulls and a 63 percent drop for herring gulls. Between 1996 and 2008, the number of herring gulls in Cumberland County declined by 60 percent, she said. On Great Duck Island, bald eagle attacks on sea gull nesting colonies have been especially intense this summer, with as many as 15 attacks in a 12-hour period, according to Anderson. There is one nesting pair of eagles on Great Duck Island, he said, but the number of attacks suggests that eagles from nearby Frenchboro, Swan’s Island and Mount Desert Island are making the trip to Great Duck, located about six miles south of MDI, for the easy meals the gull colonies provide. The attacks most often occur in early morning or at dusk and consist of either one adult eagle or an adult accompanied by a juvenile learning how to hunt. The raptors land in the colony and simply walk around, picking up and devouring flightless gull chicks as the adult gulls whirl around furiously overhead. Shlepr said the herring gull colony at the southern end of Great Duck, near where COA researchers stay during chick-rearing season, seems to be faring better than other nearby gull colonies. The eagles seem to be wary of people, she said, which likely is why another gull colony at the northern end of the mile-long island seems to have largely relocated to the southern end. According to Anderson, evidence suggests there have not always been high numbers of seabirds on Maine’s coast. Ancient piles of discarded shells that have been examined by archaeologists show no trace of seabird bones before the arrival and settlement of European colonists in the 1600s, he said. As humans set up permanent settlements along the coast, bald eagles and other seabird predators such as the sea mink started to decline, Anderson said. Sea minks, once prized for their pelts, are believed to have been hunted to extinction in the 1800s, he said, but the smaller American mink continues to be a problem for seabirds. “When a mink gets in a seabird colony, it’s the end,” Anderson said. Charlie Todd, an eagle biologist with Maine Department of Inland Fisheries and Wildlife, said a reduction in gulls could be good for terns, which gulls often eat. The increase in bald eagles may be having an adverse effect on osprey, however, which seem to be in decline, he said. In addition to their population declines in Maine, gulls, cormorants and eider ducks also are declining in Massachusetts, according to Todd. But eagles have much less of a presence in southern New England than they do in Maine, he said, which suggests that other factors are at work. Todd added that ongoing pollution problems could pose long-term problems for eagles, despite their increase in numbers. The higher up the food chain an animal is, the more man-made pollutants it is likely to have accumulated in its system. Birds like gulls and cormorants are more likely to contain such contaminants than small fish herring or alewives, he said. Iain Stenhouse, director of the marine birds program at the Gorham-based Biodiversity Research Institute, said July 27 that the decline of seabird predators and a temporary increase in food sources may have contributed to herring gull populations becoming “artificially high” in the late 20th century. Even without the recovery of the eagle population, he suggested, other environmental changes could have resulted in declines in Maine’s gull population. Food might be the biggest natural factor in the relative health of a species, but human activity and influence may be the biggest factor, Stenhouse said. The use of pesticides such as DDT, the operation of landfills, overfishing, loss of wetland habitat and ongoing pollution issues all have had and continue to have major effects on coastal bird habitat — to the point that restoring endangered species to their former population levels may have unanticipated consequences for other species.